Welcome to Drone Print! 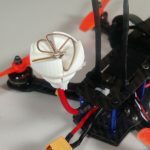 In this bi-weekly series, we find and print awesome designs that we can use with our drones or add to our gear bag! We overview why we selected the design, show the print process, and finally review the outcome. This week we look at another gear addon for our bags. Hate changing props at the field? This simple tool can fit in any gear bag and make swapping broken props a much less frustrating process. Enter the prop changer! Most hard crashes result in at least one prop swap. 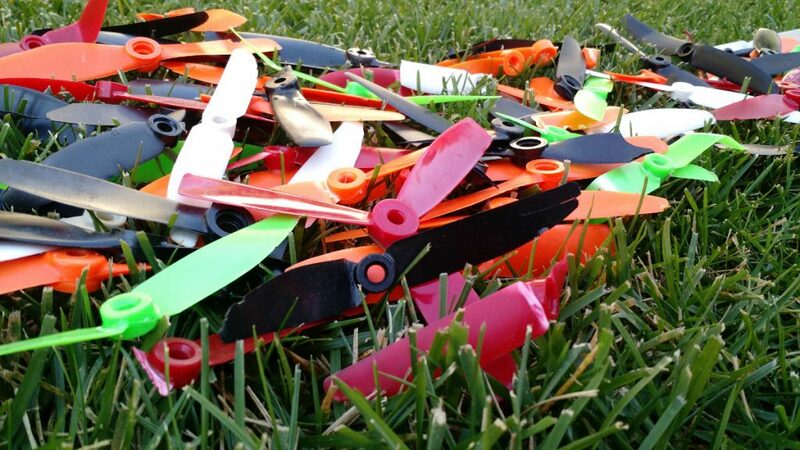 Luckily, props come cheap, and are arguably the fastest repair you can make post-crash. However, splintered and broken plastic can be difficult to hold on to, and make the swapping process frustrating. 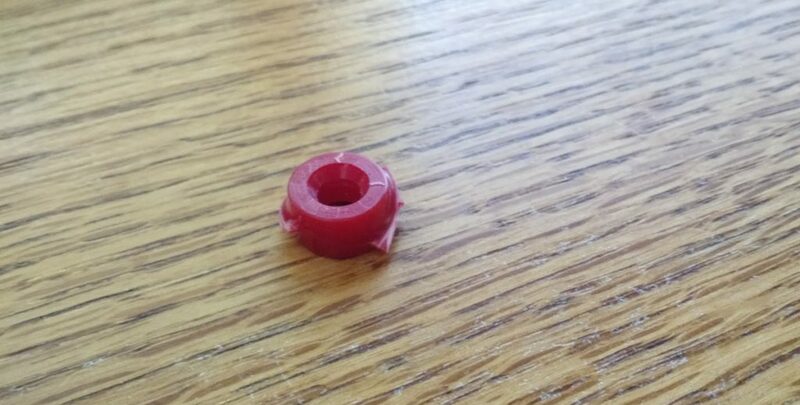 Ever break off all your blades and get stuck with just a ring of plastic? Without using the leverage of the blades, the motor can be difficult to hold on to and make for an unnecessarily lengthy pit stop. Seriously, these breaks are the worst! Yes, this may be the ultimate first world problem when it comes to drone repair. 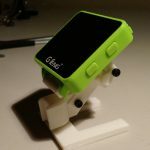 A few months back, we saw a post on Reddit linking to this Thingiverse page. 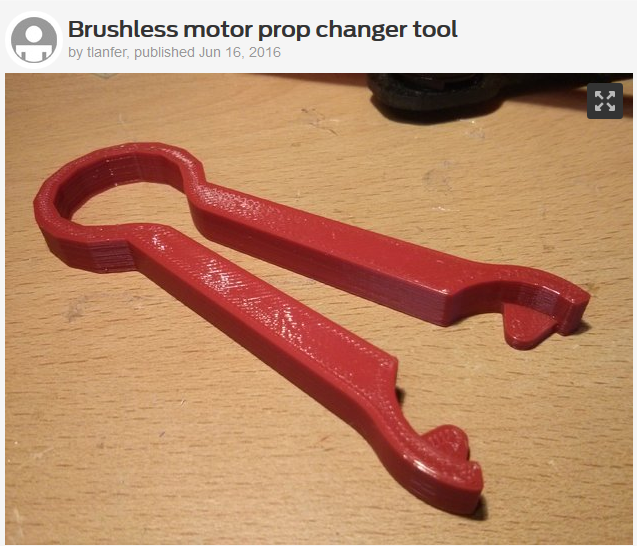 Behold – the brushless motor prop changer tool. Conceptually, you slip this tool under the propeller to grip the motor while you screw (or unscrew) the nut holding the prop in place. 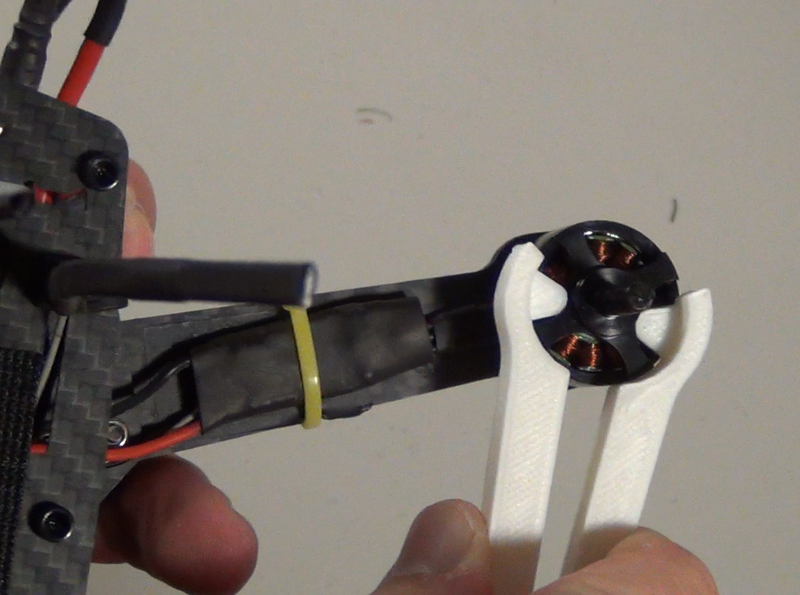 This allows you to swap props without having to awkwardly palm the prop or keep a grip on a slippery motor. Is this an unnecessary tool? You bet! However, if it helps optimize my field time, takes up minimal bag space, and prevents me from muttering expletives at the park, I figure, why not? Let’s print this sucker. I grabbed the print off this Thingiverse link. Looking at the files, it seemed extremely easy to print with no assembly required – a huge plus in my book. 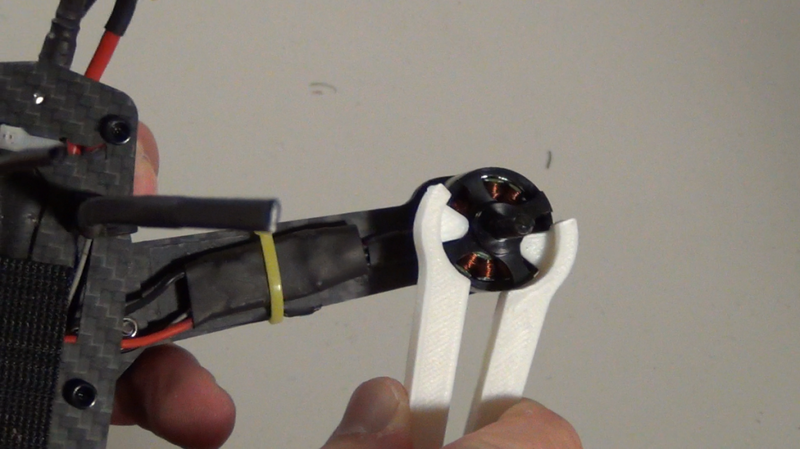 It was designed with Emax style motors in mind, but looked like it would work just as well with my RCX motors. As usual, I did a quick search on “prop changer” to see what other options were out there. There was a universal model that may be interesting to those with narrower spacing on their motors. 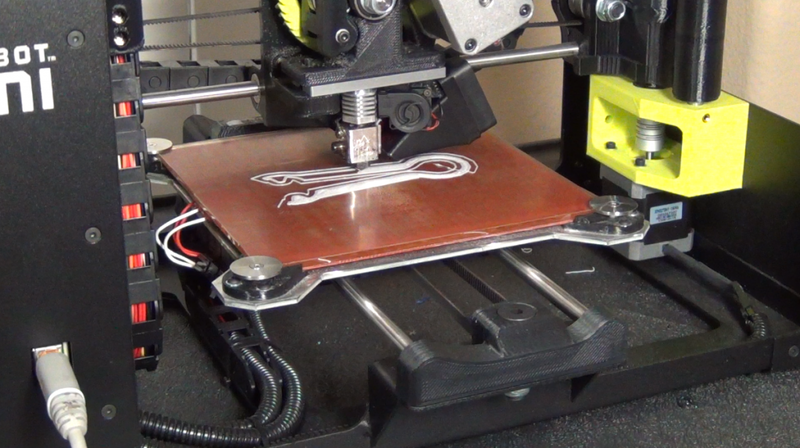 I decided to go with the original print due to its simplicity and compatibility with my motors. Per usual, I downloaded the design, fired up Cura, and dropped the print in. Drop and print – my favorite! No modifications needed. Everything fit perfectly, so no manipulating was needed on my side. As an added bonus, it only took about 50 minutes for the whole print plus cooldown process. The final result! Super clean, with no modification required. Honestly, for a one trick pony tool, I found it quite useful in the field. 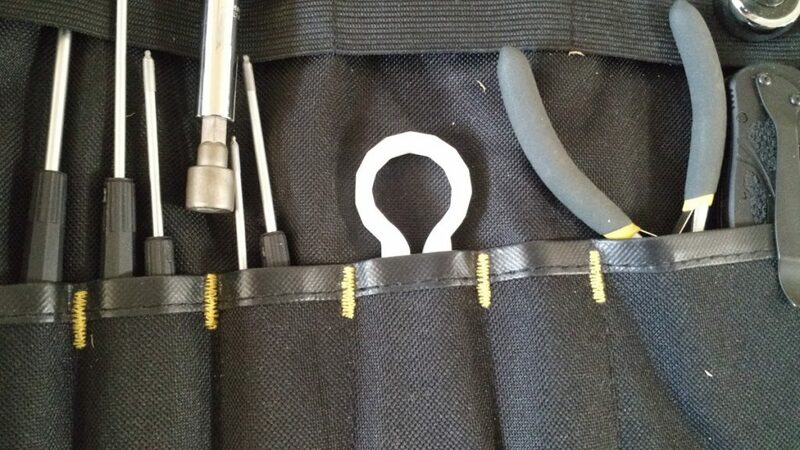 It takes up minimal space in my tool bag, and is great for quickly swapping problematic props. In general, I don’t use it much for securing props, but I do use it quite often when removing broken props. I love that I don’t have to grip splintered plastic when fiddling with a prop replacement. Surprisingly, I have found the prop changer extremely useful in the damper fall / winter months. While I have nothing to complain about here in mostly sunny Southern California, I have found the tool to be a great addition to the gear bag on dewy morning flight sessions. Instead of dealing with a damp, slippery motor post-crash, I can just bust out the prop changer and easily grip the motor every time. So obviously this was not something I considered when originally printing this, as the weather then was forecasting forest fires rather than any semblance of moisture. Would I recommend it? Definitely. 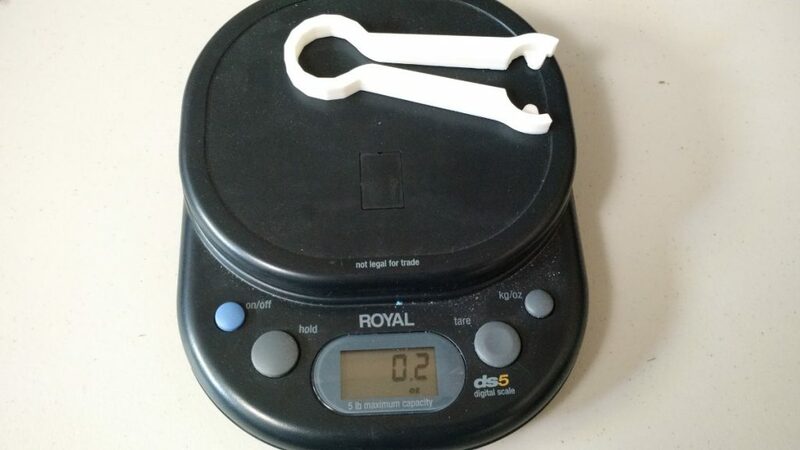 It takes up almost no bag space, adds no weight, was simple to print, and is periodically very useful. If you have a 3D printer, I would give the print a shot. Fits perfectly in a spare tool compartment! Want one? Check out our giveaway! 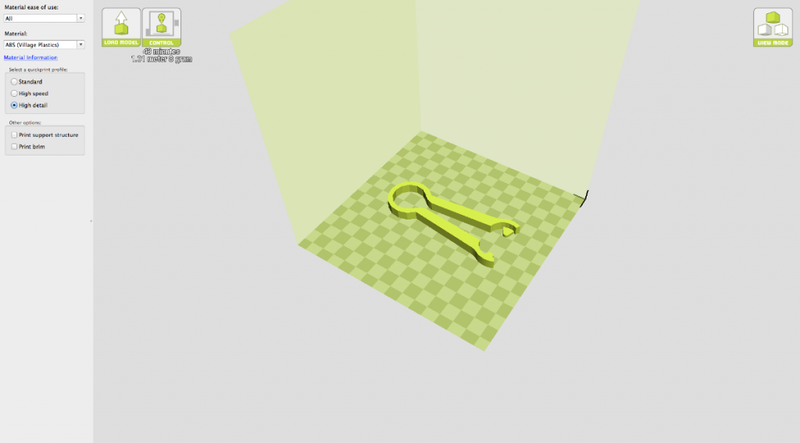 Want this print but don’t have a 3D printer? Well, we want to give one of these away to one of our readers! Wait, did I say one? This time we are going to give away TWO prints! We will give the prints away in a Rafflecopter drawing, which you can enter using this link, or the embedded option below. There are a few ways you can enter to win, so select an option (or two!) that works for you! Thanks for reading! If you want more DronePrint, you should follow us on Instagram! We post a ton of drone related pictures, including our most recent 3D prints! You can also join our Facebook group, where we share designs and printing ideas daily! 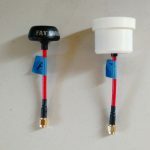 Next Drone Print article – building an antenna protector! Read it here!